The massive dust storm on Mars has created some eerie views without shadows for NASA's Curiosity rover, like this image taken on June 17, 2018. Thanks to the massive ongoing dust storm on Mars, the Red Planet looks pretty eerie and shadowless right now. Last week, NASA released a photo of the Martian surface that shows the Curiosity rover's Duluth drill site in Gale Crater both before and after the start of the dust storm, which now covers the entire planet. In the photo below, the planet's surface appears bright, cherry red and totally shadowless. The eerie sight hardly seems real … but it is. These two images were taken by the Mast Camera, or Mastcam, aboard NASA's Curiosity rover. The photo on the left was taken on Sol 2058 (May 21) and shows the rover's drill site before the dust storm. The photo on the right, taken on Sol 2084 (June 17) after the dust storm had begun, shows the dramatic difference as Mars appears red and shadowless. Two images show the "Duluth" drill site on Mars both before and after the dust storm that grew to cover the entire planet. The left image, taken before the storm on Sol 2058 (May 21) is drastically different from the image taken on Sol 2084 (June 17) that appears bright red and shadowless. So why aren't there shadows in the image? 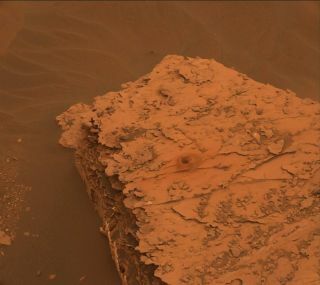 Because the dust in Mars' atmosphere has completely covered the sky when viewedfrom the planet's surface, Mike Malin, principal investigator for the Mastcam instrument, told Space.com in an email. The effect is "like an overcast day on Earth," Malin said. Even though, if you were standing on Mars, you wouldn't be able to see the sun, the sky is bright "almost uniformly everywhere (uniform to the eye; photometric instruments can tell roughly where the sun is)." Because the sky is illuminating the planet's surface so uniformly, it decreases shadowing, Malin said. It looks darker on Mars than it might on a cloudy day on Earth, however, because clouds of dust obscure much more light than clouds of water droplets, and sunlight on Mars is only half as bright as that on Earth to start with, because of the planet's distance, he added. So, for now, because the Martian atmosphere is chock-full of dust, the planet's surface lacks shadows. The bright red color in the image of the Duluth drill site from June 17 has a different explanation, however. The dust on Curiosity reduces the light that the Mastcam can use, thus requiring the camera to use a longer exposure, according to a statement from NASA. The dust storm caused the exposure time on the camera to be nine times longer than usual, leading to a distortion in color. But aside from the exposure time, the main reason the image appears so red is that very little green, and almost no blue, light can make it through the dust, according to the statement. Therefore, red light is what primarily makes it through the dust. In the statement, NASA officials compared the effect to "a red stage light" that "filters the other colors out." Mars' dusty, red, shadowless appearance may have an explanation, but it doesn't make it look any less creepy.